The CS540 wireless headset is compatible with most business telephones due to its technologically advanced compatibility side switch. The CS540 compatibility slide switch is easily changeable to allow operation with your particular phone. After you have your CS540 wireless headset plugged in and charged, its time to make your first call. Remove the handset from your phone and press the call button on the side of your headset. Hopefully you hear a dial tone and you’re ready to dial your number. If not, you need to change your CS540 compatibility setting switch. 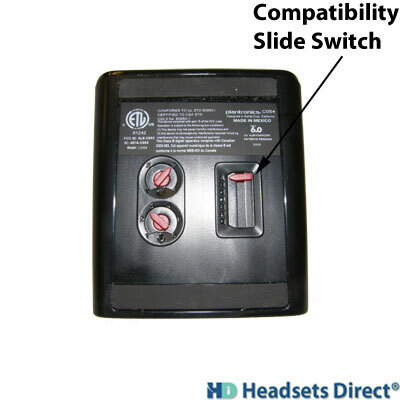 The CS540 compatibility slide switch is located on the bottom side of the CS540 base labeled A-G. The default setting is A and works on most phones, but if you don’t hear a dial tone, slide to the next letter until you hear a dial tone. Once you hear a dial tone, make your first call and continue adjusting your speaker and microphone settings.